Marian Pallant’s lungs burned and her legs ached. She ran as if the devil himself were at her heels. Perhaps he was, if the devil was named Napoleon Bonaparte. Napoleon had escaped from Elba and was again on the march, heading straight for Waterloo and a clash with Wellington’s army, and Marian was in the middle of it. Already she heard the random cracking of musket fire behind her and the sound of thousands of boots pounding into the muddy ground to the drum beat of the French pas de charge. Somewhere ahead were the British. The muddy fingers of the earth, still soaked from the night’s torrential rains, grabbed at her half boots. The field’s tall rye whipped at her hands and legs. She glimpsed a farm in the distance and ran towards it. If nothing else, perhaps she could hide there. Only three days earlier she and Domina had been dancing at the Duchess of Richmond’s ball when Wellington arrived with news that Napoleon’s army was making its way to Brussels. The officers made haste to leave, but, during a tearful good-bye, Domina had learned from her most passionate love, Lieutenant Harry Oliver, that, unless the Allies were victorious at a place called Quatre Bras, the Duke expected to defend Brussels near Waterloo. Domina spent two days begging Marian to come with her to find Ollie’s regiment. Domina was determined to see the battle and be nearby in case Ollie needed her. Finally Marian relented, but only to keep Domina from making the journey alone. Marian thought of them dressing in Domina’s brother’s clothes so it would not be so obvious they were two women alone. They’d ridden together on Domina’s brother’s horse for hours and hours in darkness and pouring rain, hopelessly lost until they finally heard men’s voices. Domina had panicked, kicking the horse into a gallop so frenzied that Marian flew off and hit the ground so hard the breath had been knocked out of her. Afraid to call out lest the French hear her, Marian watched Domina and the horse disappear into the rainy night. She huddled against a nearby tree in the darkness and pouring rain, hoping for Domina to return. Marian spent the night full of fear that Domina had been captured by the French. What would French soldiers do to an English girl? But when daylight came, she’d shoved worries about Domina from her mind. The French columns had started to march directly towards her. The farm was her only chance for safety. A wooded area partially surrounded the farm buildings, and Marian had to cross a field of fragrant rye to reach it. The crop would certainly be ruined when the soldiers trampled on it, but for now the tall grass hid her from Napoleon’s army. Still, she heard them, coming closer. Her foot caught in a hole and she fell. For a moment she lay there, her cheek against the cool wet rye, too tired to move, but suddenly the ground vibrated with the unmistakable pounding of a horse’s hooves. Too late. The huffing steed, too large to be Domina’s, thundered directly for her. Her boots slipped in the mud as she tried to jump aside. She threw her arms over her face and prepared to be trampled. Instead a strong hand seized her coat collar and hoisted her onto the saddle as if she’d been a mere satchel. “Here, boy. What are you doing here?” An English voice. She opened her eyes and caught a glimpse of a red uniform. “I want to go to that farm.” She pointed towards the group of buildings surrounded by a wall. Was that the name of the farm? Marian did not care. She was grateful to be off her weary feet and to be with a British soldier and not a French one. The horse quickly reached the patch of woods whose green leaves sprinkled them with leftover raindrops. A low branch snatched Marian’s cap from her head and her blonde hair tumbled down her back. She turned to get a proper look at him. Her eyes widened. She’d seen him before. She and Domina had whispered about the tall and handsome officer they’d spied during a stroll through the Parc of Brussels. His angular face looked strong, his bow-shaped lips firm and decisive, his eyes a piercing hazel. “I am lost,” she said. Did he think she was doltish? She repinned her hair as best she could and covered it with the cap. Behind them came the sounds of men entering the wood. A musketball whizzed past Marian’s ear. “Skirmishers.” The officer set his horse into a gallop so swift the trees suddenly became a blur of brown and green. They reached Hougoumont gate. “Captain Landon with a message for Colonel MacDonnell,” he announced. Marian made note of his name. Captain Landon. The gate opened. “There are skirmishers in the wood,” he told the men. “We see them!” one soldier responded, gesturing to a wall where other men were preparing to fire through loopholes. A company of soldiers filed past them out the gate, undoubtedly to engage the French in the wood. The colonel paced through the yard, watching the men and barking orders. Some of the men wore the red coats of the British; others wore a green foreign uniform. “Stay with me.” Captain Landon told her. He dismounted and reached up to help her off the horse. He gripped her arm as if afraid she might run off. He held onto her even when handing the message to the colonel and waiting for him to read it. “An English lad caught in the thick of things.” Landon squeezed Marian’s arm, a warning, she presumed, to go along with his story. Marian’s mind whirled, trying to think of a name she might remember to answer to. “Fenton,” she finally said. “Marion Fenton.” Her given name could be for a boy, and Fenton was Domina’s surname. If anything happened to her, God forbid, perhaps Domina’s family would be alerted. No one else knew she’d come to Brussels. The captain marched Marian into the chateau. Green uniformed soldiers filled the chateau’s hall and adjacent rooms, some gazing out the windows. “Why are they in green?” she whispered. The soldiers looked frightened. Marian thought them very young, mere boys, certainly younger than she at nearly twenty-one. The officer nodded and spoke to his troops in his Germanic tongue. Captain Landon led Marian away. They walked through the house, searching, she supposed, for a room without a window. “I need to talk to you first.” His voice was low and angry. She supposed she was in for more scolding. She deserved it, after all. They walked through a hallway into what must have been a formal drawing room, although its furniture was covered in white cloth. Captain Landon finally removed his grip and uncovered a small chair, carrying it back to the hallway. “You will be safest here, I think.” He gave her a fierce look and gestured for her to sit. She was more than happy to sit. Her legs ached and her feet felt raw from running in wet boots. He merely glared, as if waiting for a better answer. Chivalrous Captain, Rebel Mistress won fifth place (out of 10) in the Historical category of the 2010 Cover Café Cover Contest. Winner! 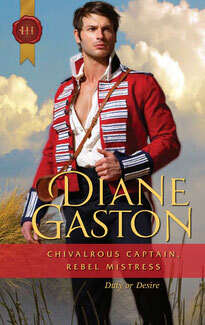 Chivalrous Captain, Rebel Mistress won a 2011 Award of Merit for Best Book by a Virginia Authorin Virginia Romance Writers Holt Medallion Contest! In Chivalrous Captain, Rebel Mistress Allan Landon and Marian Pallant reunite two years after meeting on the battlefield of Waterloo. Peace might have been achieved in Europe, but England in 1817 was rumbling with discontent. Unemployment was alarmingly high and the unpopular Corn Laws drove up the price of bread, the staple of the ordinary people. It was no wonder that the people’s suffering erupted into social protest. In November and December, 1816, thousands gathered in Spa Fields in Islington to protest the government policies. The great radical orator, Henry Hunt, spoke to the crowd about high prices and excessive taxation. He called for universal suffrage and parliamentary reform. The meetings, even though reaching numbers as great as 20,000, were generally peaceful, but the December 2 meeting degenerated into riots. It was discovered that one of the men inciting the riots was also a spy for the government, an agent provocateur. Still, the events at Spa Fields convinced Lord Sidmouth, the Home Secretary, that revolution was in the wind. (Remember, the French Revolution would have been fresh in the minds of the British Peerage). Parliament passed the Gag Acts suspending Habeas Corpus, banning seditious meetings and the printing of seditious documents. This meant anyone could be arrested and held without charges, and it meant the limiting of free speech and a free press. Quite extreme measures. But they didn’t stop the protesters. In March of 1817, organizers in Manchester came up with an idea for a legal, peaceful march. Men would march to London in groups of ten, carrying blankets on their backs and wearing a petition on their arms. They were attempting to protest within the boundaries of the law, but Sidmouth was convinced that they planned to storm the city. The Blanketeers were arrested even though there were no charges that could be brought against them. Only one man made it to London to deliver the petition. The March of the Blanketeers convinced Sidmouth that the people were rising against the government. Parliament passed the even more repressive Seditious Meetings Act forbidding any political meeting of more than 50 people. Breaking these laws was a treasonable offense. In June 1817, another protest, the Pentrich Rising, took place and again an agent provocateur, one of Sidmouth’s men, “Oliver the Spy,” played a big role in inciting violence. It was thought that he acted under Sidmouth’s instruction. Protests, provocateurs, and Lord Sidmouth figure prominently in Chivalrous Captain, Rebel Mistress. I’ve given Sidmouth a villainous personality which may be entirely fictitious, but like some politicians of our day, his zeal to protect his political interests and his position of power seem to have caused him to overstep the bounds of what was ethical behaviour. Marian and Allan were caught up in the tensions and drama of these real events, but they found themselves on opposite sides of this social war, and neither was willing to admit defeat.